Patti Wood, MA - The Body Language Expert. For more body language insights go to her website at www.PattiWood.net. 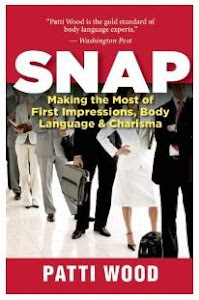 Check out Patti's website for her new book "SNAP, Making the Most of First Impressions, Body Language and Charisma" at www.snapfirstimpressions.com. New SNAP BOOK Website "SNAP - Making the Most of First Impressions, Body Language and Charisma"
SNAP BOOK Website "SNAP - Making the Most of First Impressions, Body Language and Charisma"